TACLOBAN CITY- The Department of Interior and Local Government (DILG) has formally reinstated Southern Leyte Governor Damian Mercado following a Court of Appeals decision reversing the previous dismissal order of the Office of the Ombudsman. 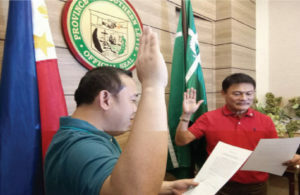 Mercado, who is seeking for another term in next year’s midterm elections, was reinstalled by DILG regional legal officer Cyril Blanco on October 31. The reinstatement of Mercado as governor of the province was made possible after the Court of Appeals reversed the decision of the Ombudsman ousting him from office. “With this order, there is no more doubt that I am back into office. We will continue to give service to our people,” Mercado told reporters in a press conference held after he assumed the office temporarily held by Vice Governor Christopher “Coco” Yap. On August 10 last year, the Ombudsman found Mercado liable for grave misconduct in the alleged anomalous procurement of vehicles amounting to P2.3 million when he was still Maasin City mayor in 2007. He was suspended the following month.